I SWEAR that wasn't there 16 days ago!!! Despite being advised Farilla and I didn't take any "before" pics. It's not like I would have posted them here anyway. So, it just wasn't high priority. We did finally take down some base measurements (at the end of week one), though. My scale measures BMI, Weight, Skeletal Muscle, Fat, Visceral Fat & Metabolism. It'll be interesting to compare our starting numbers with our measurements at the end of 90 days. Everything's going well. The workouts are pretty advanced and challenging but I push myself to do what I can. On the downside, my appetite is raging! Seriously, ALL I THINK ABOUT IS FOOD. Hello, metabolism! 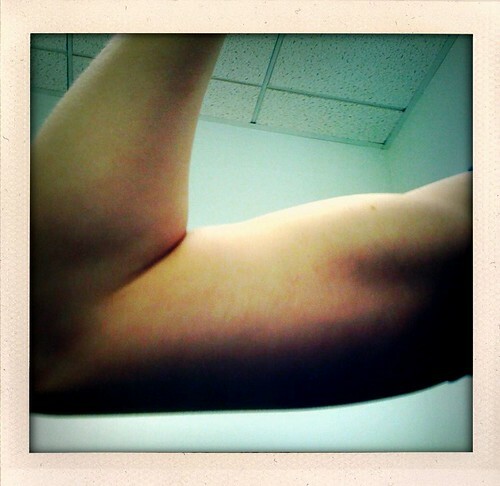 Ha, the arm photo looks like a blown-up continuation of your profile pic! Oh, snap! That just made me laugh out loud. Had not noticed. I love it. Again, how do the pull ups go???? Daniel made me take before pics of him, but he ditched the food mods pretty early. Pull-ups are still chair assisted. And even at that I can't do many. We never got on board with the diet. I should have a look at it just to see what they recommend. I suspect it's not in line with my current vegetarian diet so it may be hard to adapt to my lifestyle anyway.